Next in our story of the major arcana, and noting differences between the original Rider-Waite (RW) tarot versus the Angel Tarot is 3-The Empress. After spending quiet time in meditation with The High Priestess, The Empress tells us we are ready to take action. 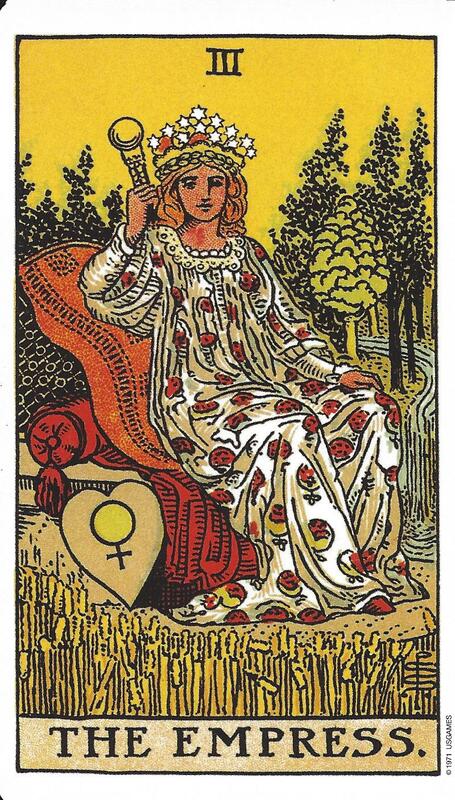 The Empress is often shown as a pregnant woman sitting in nature, similar to the Rider-Waite (RW) tarot. However, you will note that in the Angel tarot the Empress is Archangel Gabriel who stands holding a baby–her creation. In the RW tarot, the Empress is seated with a diadem on her head showing 12 stars. At her feet, there is a shield with the symbol of Venus. Some say the scepter she is holding is topped by a globe of the world. 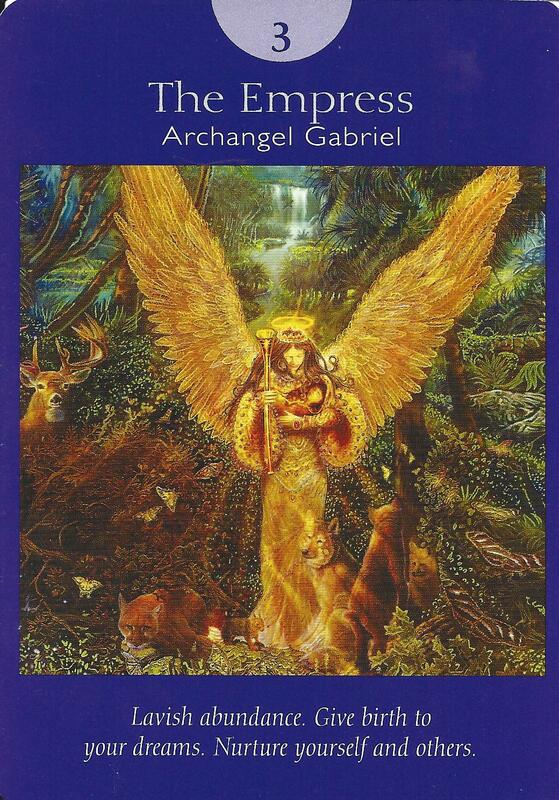 There is lots of symbolism in the Angel tarot starting with the waterfall that flows from the top of the card. This represents the water that was at the feet of the High Priestess. Our energy with The High Priestess flows into The Empress, ready to materialize as our creation. In the RW tarot, the water is flowing through the trees and falling near the feet of The Empress. Other symbolism includes the baby bear, who hibernates in the winter and awakens new in the spring. The butterflies are also animals that transform themselves from quiet time in a cocoon to colorful winged creatures. The coyote symbolizes work in groups. Coyotes are pack animals and they encourage you to work in groups to bring your creation to fruition. If you draw this card it could indicate the coming of a child (by birth or adoption); the coming of a project; or the coming of a new phase in your life. Like the mother image, it is important to take time to nurture yourself and those in your tribe.The coyote is also a symbol of caring for the tribe.The Empress lets us know that if we dedicate ourselves to our passions, we can be abundantly rewarded.